Ok, so I have been trying my hand at doing Tee shirt designs for sights like threadless, ript appareal , and tee fury. I had submitted a couple of designs off to the latter companies with no luck. In their defense, the designs were not very good. 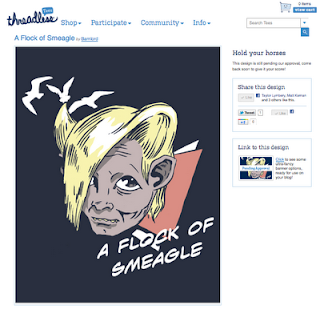 So, I just submitted another design over at threadless. I will have to admit, the design is silly. And I might have to make changes to get the text right. IE: (Getting Smeagols name right. I spelt it Smeagle.) I might see if I can do that this evening. But, I really want this design to be picked up. I need you all's help. It is up for review right now, but please, please help me spread word about this to everyone you know. And... when the time comes, go vote for it... if you can. I hope you like it. I have some other ideas to put on paper, but for now figured I would start with this one.